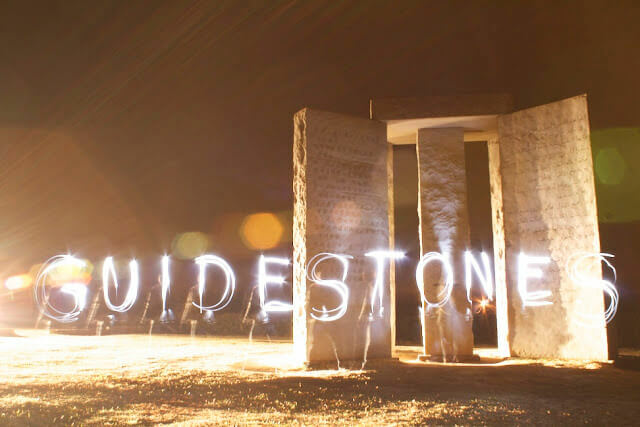 One of the most disquieting aspects of the Georgia Guidestones is the very first of the ‘commandments’: “Maintain humanity under 500,000,000 in perpetual balance with nature.” The concept of population control is not exclusive to the Guidestones, especially insofar as drawing a correlation with a balance with nature, but the 500 million is 1/16th of the present population that would have to… die. Most commonly, this topic pertains to controlling future births, including debates about the use of contraceptives vis-a-vis Catholicism or government intervention, such as China’s one-child policy. But what option is there to reduce a population if it is seen as 7.5 billion people more than desired? And if so many people are to die, could it be a gradual process or would it necessarily have to be a single, sudden method? The commandments on the GA Guidestones are then advice not for those of us who currently see them, but those left after some cataclysmic event, since it is only once the population is below 500 million that anyone can ‘maintain’ the population of that size. Population levels were already approximately 4 billion in 1975 – over 5 years before the center cluster of the Guidestones were erected. The use of the word maintain clearly conveys that this message is not for those alive before a cataclysmic event. loved and will be cared for. The tenor is such to evoke the impression that intercession will occur either supernaturally or by space aliens. […]I deeply doubt the veracity of these claims, but if there is any possibility that they are true, the “activation event” can only mean that Polaris, the North Star, will drift out of the sighting hole drilled into the Gnomen stone. When I was last at the Guidestones this fall, Polaris was barely visible within the sighting hole. their ancestors built in order to track polar alignment to warn of the coming Day of Purification, a very similar catastrophe used as fodder for 2012 hysteria. If anything, 2012 hysteria will be used as a smokescreen for manmade chaos leading up to that event. Astronomy-based events, or natural disasters more broadly, is but one theory to describe so catastrophic a drop in population. However, there is reason to consider for whom population control benefits and, apart from a general interest in nature, who could assume they would be one of the 500 million to survive and also contribute to the event that reduces the population. Van Smith uses this as the basis for his assertion that R.C. Christian is Ted Turner. Yet, even with these theories in mind, we are still no closer in conceiving how the population will be so drastically reduced in size in order for this ‘new world order’ to exist. The topic, however, has no shortage of stabs in the dark made every day with regard to any number of natural disaster theories, biological contaminates, etc. We will look at some of these in future weeks.